This week's installment of the semi-regular A Copa Con.. is another near and dear to my heart (And perhaps would be better titled 'A Partido Con..'). I have met many exciting cooks + chefs here in Basque Country, but some of my favorites have been the young folks that have come through with BasqueStage. They are hungry, looking to learn, and sometimes even pretty awesome. 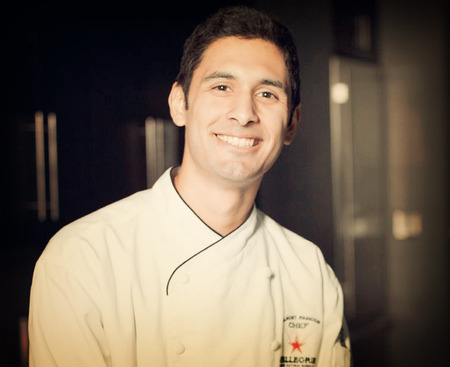 Enter Marco Bahena, who was a BasqueStage and also recently named one of Eater.Com's Young Guns, a list of upcoming chefs with promise. He's currently cooking at Everest in Chicago. Read on to see what it's like to be young and cooking today. When I met you, you had just won a scholarship to cook in Basque Country. That was two years ago. What have you been up to since then, in a nutshell? After I completed the Sammic BasqueStage scholarship I went to work in the south of France in a small restaurant called Bistro Savuers. When I came back to the U.S. I took a position at an Alsatian French restaurant called the Everest in Chicago. At the Everest I hold a line cook position working on the meats station. In what ways has your time in Basque Country had a lasting effect on you? It’s funny to think that it has been two years since I’ve left. I miss everything about being there. In the same town you have some of the most cutting edge 3 Michelin star restaurants in Spain which are also surrounded by a pintxo bar scene that people can’t stop talking about all over the world. Then the food itself is incredible before it has even touched a pan. I go on and on telling people about the incredible mushrooms, foie, txuletas, txipis, and anchoas, but words don't do justice. Then there’s the seemingly bi-weekly food festivals which leave the streets smelling of cider and sausage. I mean it just doesn't stop. It’s a culture that thrives on food and cooking. Along with the friends I’ve made there it has really made a place in my heart. I think it really opened my eyes to a new way towards thinking about food. I compare everything to the different restaurants and bars I ate around at while there. Simplicity is the first thing that always comes to mind. The products are cared for and treated like children and you can see it in the way dishes are served and plated there. It’s changed my palate and the types of ingredients I use. Vinagre de Jerez, paprika and espellete are daily staple ingredients now. You were named to the Eater's Young Gun list. Was this expected? Any idea how it came about? I actually had no idea until a friend happen to post a link on my facebook page congratulating me for making the list. For whatever reason, I'm always the last one to know about these things. It was a great honor and a surprise. There was a really talented group of people on that list and I was just happy to be a part of it. I later found out that it was actually Tony Mantuano of Spiaggia who nominated me for the list. I first met him through the San Pellegrino almost famous chef competition in which he was one of the Chef Judges Critiquing my dish which won the competition. That's one of those questions that is always so hard to answer. I have big ambitions and a plan in mind, but I’m taking the opportunities as they come. I’m at a developing point in my career and will be very influenced by the places and people I surround myself with. For the next few years I would really like to continue trying to work in other countries or even the Basque region again to become more culturally diverse in food. I’m young and have the freedom to go cook in foreign lands at the drop of a hat and I plan on taking full advantage of that while I still can. As for 10 years in, I really don’t know. I would be 34 years old and I guess I can only hope that I’m at an established successful point in my career and have a beautiful loving family to care for. When you're home alone, what do you fix yourself for dinner? Working at a French restaurant I get more than my fair share of buttered baguettes so I try to eat a bit healthier when I can during the week. With the late hours I’m often home by around midnight so cooking something elaborate is the last thing on my mind. This usually leaves me plopped on the couch with a big bowl of Wheaties or cheerios mixed with a cut up banana and cinnamon. What's your guilty pleasure, food-wise? 'm a big fan of sweets and love nibbling on anything sugar coated. Though its ice cream that takes the cake. Preferably two scoops in a crunchy waffle cone, covered in syrupy strawberry chunks...or anything the pastry girls at work are willing to give me really. What's your guilty pleasure, food-wise, that you are ashamed of? Who do you think is the most important chef working today? Why? I really like Jose Andres and the way he has touched the food industry in so many that everyone can’t help but love him for one reason or another. He has a list of high end, innovative restaurants that he owns from Washington to Las Vegas that have really brought a lot of attention to Spanish cuisine in the states. Then for the past few years he’s been working with Harvard’s food science team to really dig deep into the “why’s” of cooking Trying to develop a much deeper understanding of food for cooks and scientists alike. He then translates that to developing his “World Central Kitchen” organization to try and build Sustainable food systems in third world communities that desperately need it. He’s made such a positive lasting impact on so many different levels and is such a great voice to have representing our industry. Thank you so much for the interview Marco!